The new car market is full of rolling contradictions: There is the fast looking youthful car that can’t even beat Grandma’s 15 year old Buick in a 0-60 mph sprint. The rock climbing SUV that looks macho enough to pump iron, but gets easily jostled when you jump a curb. Even gargantuan minivans that are anything but mini, and have enough cup holders to function as a drought abatement tool for Californians. Well, for starters, compact crossovers like the HR-V are as different as minivans and SUVs once were to the cars and trucks that formed their physical foundations. You sit higher in an HR-V than you do in a sporty Honda Fit, even though they share the same platform. The profile of the Honda HR-V appears to be a bit narrower than Honda’s other compact, the Civic. Yet it offers surprisingly more usable space. The back seat can stow away anything from a mountain bike to several large potted plants. (At least that’s what the inner gardener in me saw when I maneuvered the rear seats with one hand to a resting vertical position.) If you fold down the front passenger seat, the HR-V can also swallow up a variety of long and narrow items – from surfboards to 4x8 sheets of metal and plywood. In a world where cars are designed to become longer, lower and wider with every generation, the HR-V appears to be shorter, taller, and more bloated. Yet, in person, the bloat is pretty much a functional byproduct of taking the Fit’s chassis and stretching out the shape to maximize the HR-V’s functional space. It looks compact and muscular without being plump, and at less than 3,000 lbs. 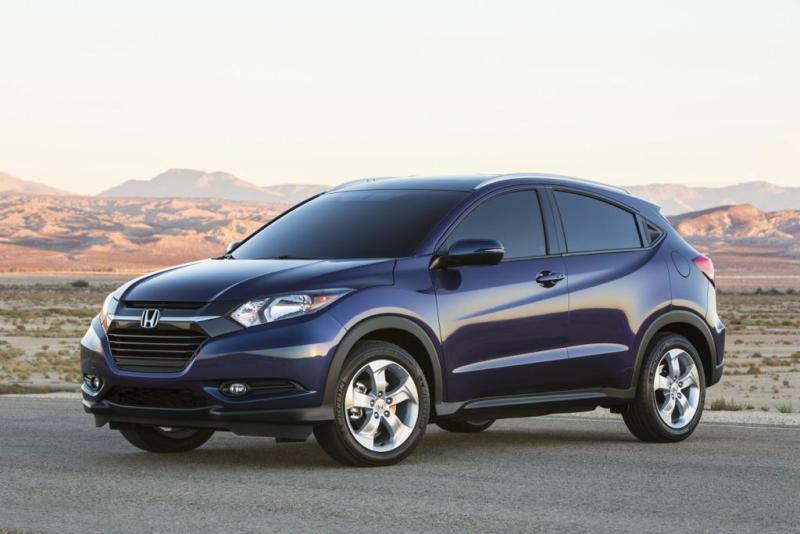 when equipped as a front-wheel drive model, the HR-V is within 100 to 200 lbs. of the Civic sedan. It also feels a bit more tight and taut than the Civic when it comes to city and highway driving. Although it’s technically a four door hatchback, the HR-V feels more like a coupe to many of us who regularly drive older sedans. If you haven’t driven a new vehicle in a while, you’re in for quite a shock. The steering is tight, compact, and lends a strong user-friendly feel to the overall driving experience. The 1.8-liter, 141-hp engine will, in most cases, be mated to a continuously-variable transmission (a six-speed manual transmission is optional on front-wheel drive models) that can be tuned towards economy or sport depending on your preference. The CVT guided powertrain has more than enough real-world acceleration to handle most everything you need in terms of highway on-ramps and the occasional fun drive on a winding one-lane road. At the same time, the HR-V is not so much a sports vehicle as it is a utility focused crossover with a healthy sporty demeanor. The higher seating position and Fit-based chassis help to make the HR-V a fun little runabout when you are actually focused on the driving experience, and a simple commuter when you just want to concentrate on other things. But it’s not for everyone. Drivers looking to carve curves will be better served by buying a de-facto sports compact like the Mazda 3, while those opting for luxury and isolation may likely want to move up to a mid-sized crossover such as the Subaru Forester or Honda CR-V.
Do you get a better deal if you opt for a compact crossover like the HR-V? Well, if you are still focused on fuel economy, real-world safety, and don’t want the heft of a larger vehicle or the harshness of a sports sedan, then this is the Goldilocks version of "just right” in the marketplace. Fuel economy is excellent (class leading 28 mpg city / 35 highway for CVT models) with only a two mpg loss if you opt for all-wheel-drive. You also get a choice of a long list of options that are already available on the Honda CR-V. From adaptive cruise control, to lane departure warning systems, to Honda’s LaneWatch which lets you view passenger-side traffic without having to pivot your head. What impressed me most about the HR-V is that it manages to offer a smaller footprint while hitting that elusive ‘safe spot’ that a lot of families want in a compact car, but often can’t seem to find in the psychological sense. To strengthen its place as a family car, the HR-V gets a 5-star NHTSA safety rating along with a Top Safety Pick+ rating from the Insurance Institute of Highway Safety. It feels big enough, but it drives small. Starting prices range from $19,995 for an entry level model (including the destination fee) to $26,720 to a loaded EX-L model with navigation, leather seats, and a long list of features you can find here. If you are looking for a four-door model that is focused primarily on functionality in this price range, the HR-V is a unique compact crossover that hits 'em where they ain’t.